After this last school shooting I was reminded of an idea I had 47 school shootings before. Or maybe, at the least, like a courthouse. But what about banning guns, Sarah? That isn’t going to happen. There should be stricter gun control laws and I believe semi-automatic guns should only be permitted after heavy vetting to groups that charge and are responsible to governmental guidelines and safety. Solely to be used for hunting. And yes, I own a gun. We should all be able to have our pistol or our shot gun. But, let’s step back and imagine a USA with a total gun ban. There are so many guns hidden, illegal, in plain sight for that matter anyone who wants one, will still get one. From someone selling them illegally. From, their parents, from their Uncle Jimbo who has a stockpile for when the Government was going to take his guns, just like he knew they would. “Don’t you worry about it Dustin, you need something you just come to good ole Uncle Jimbo.” He has a ton in his underground prepper commune. Now that we have the gun debate faced (as best as it can be for one paragraph) it is time to look at fixing the problem. Kids getting guns and killing other kids with ease. Pissed off, mentally challenged kids, grab guns and walk into schools freely and kill. Kill multiple kids. KIDS. Children. So stop them from getting in. Put metal detectors on one entrance and one entrance only. Accompanied by 2 armed officers. The HORROR. Um, no, I had to pass through this back in August to renew my tag. I recognize it will start a bottle neck getting kids to class, so open another entrance and make it the same. We aren’t going to have gun reform any time soon. Period. So stop them from getting in. Take some sort of actions. Thoughts and prayers are the equivalent of saying Bless you when someone sneezes. It does no good, doesn’t actually help, and is straight out perfunctory. This is what I am going to suggest to my congressman and anyone else who will listen. If they have the resources to arm the teachers, instead of doing so, disarm the kids. I’m so tired of watching kids die. And I am so tired of wondering if mine will when I send them to school. It is a walking nightmare for everyone involved and NOTHING has happened. So, I refused to go to the doctor. I don’t “Hate” doctors per se but I am a mom and I know that if you aren’t running a fever and only have a mildly productive cough, no matter how sick of it you are, they aren’t going to do jack crap. So I took my 11 year old to Basketball practice, loaded up on Motrin, and purchased some Mucinex. Good as new. Sort of, is it hot in here? Nah, it is just 91 degrees outside. So. While we were at basketball practice (a half hour early because that is how I roll) the two boys were playing robbers and had their hands shaped as guns. We were in front of the middle school gym, and school is out, but all of a sudden all the news articles about little kids pointing their fingers like guns and being hanged on the spot came to mind. Ok, maybe not hanged, but they call the cops, or kick them out for a week, or something completely unnecessary. 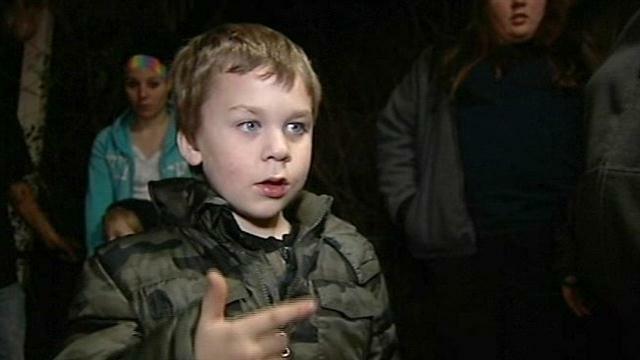 http://www.koco.com/image/view/-/18060628/medRes/1/-/u3objp/-/img-Local-boy-suspended-for-making-gun-gesture-with-hand.jpg – I am linking this here because well it is relevant. 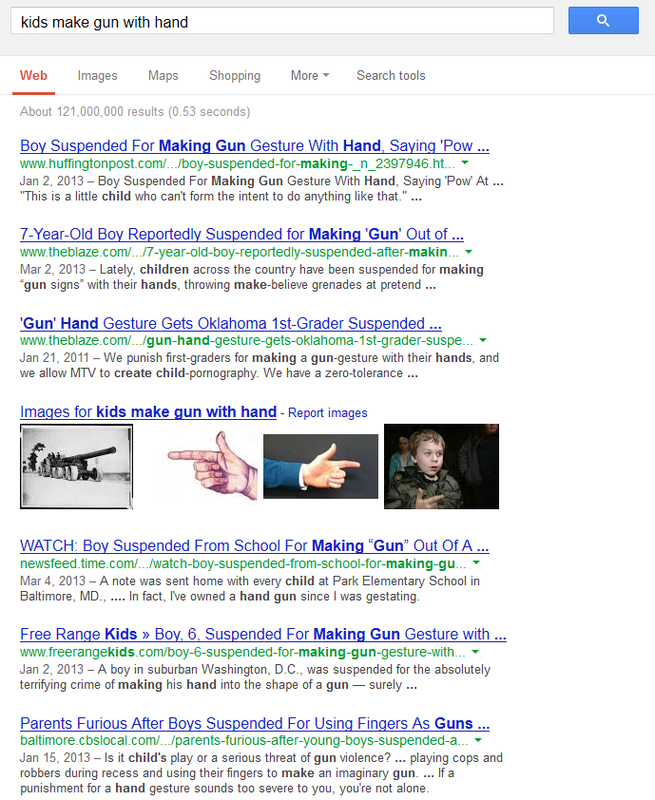 Speaking of relevance, as I was searching for an image of a kid making a gun with his hand, I swear this is what popped up. Now, this is not a post to start a gun debate. I don’t like debating. My view is mine, yours is yours. Done. See how easy that was? But, I noticed on all of these articles, and the one’s I have seen recently, the majority of these kids are elementary or younger school children. I am all for zero tolerance for a child of ANY age bringing a firearm to school or weapon of any sort. They gots to go. No problem. But to suspend or to extremely punish a child for making a gun sign with his hand, come on now America. Really? I might understand if the kid was 12 and up. I MIGHT kinda sorta if I reached really hard. They understand the implications. But a 7 year old? And yet, what did I do when I saw my 8 year old and 11 year old do it? I hushed yelled, DON’T EVER MAKE A GUN GESTURE ANYWHERE, ESPECIALLLLLYYYYYYYYYYY A SCHOOL. I know you guys are playing, but this isn’t a point to debate. JUST DON’T do it. The entire rest of the day I am going to have this on my mind. How do you teach a kid it isn’t ok to pretend, because some mental cases went in and shot kids at schools? How do you tell them children died? And the result is a banned hand gesture that was never ever ever meant in any way shape or form to connect with these events? I can’t. I don’t want to tell them about murdered children. 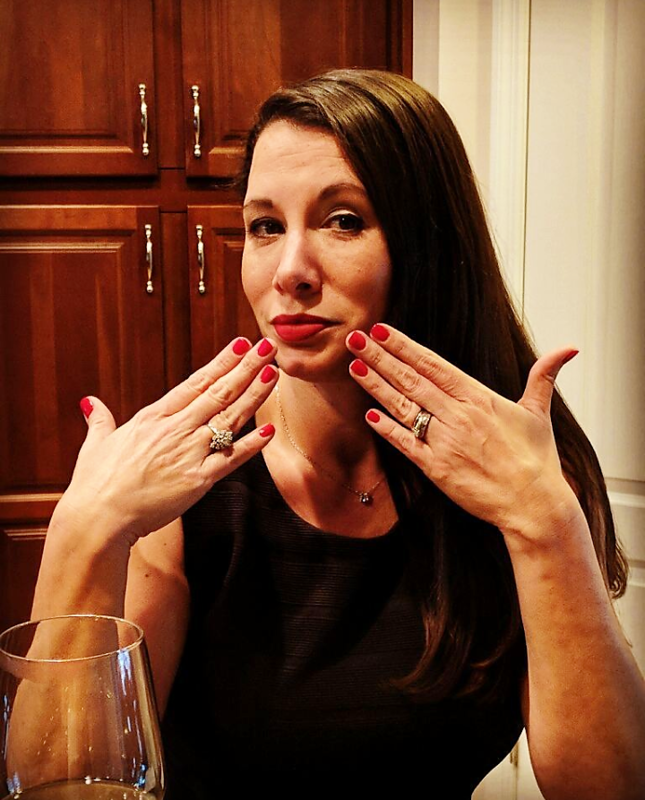 (Note: I did have a talk with my 11 year old to a point, and to a pointttttttttt my 8 year old after Sandy Hook) but in no way can I relate it back to two fingers pointing with the thumb up. Maybe I am wrong, but it just seems like a bit much.